In a bid to boost it’s search features and try to reverse its fortunes Yahoo partnered with Paypal to provide payment icons in the search results. Google has been displaying their Google Checkout icon in their sponsored search results for one year, and once again Yahoo is having to play catchup with its search featureset. 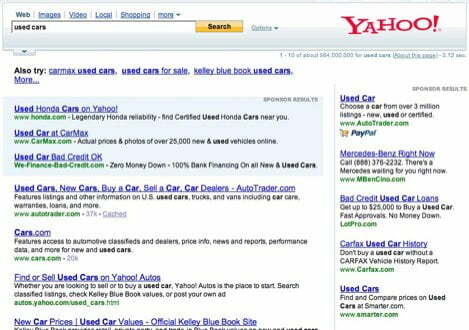 See this screenshot of a Yahoo.com search for used cars – It insinuates you can buy a car from AutoTrader using paypal! PPC search engine marketers take note – if your e-commerce website accepts paypal you will likely get a boost in ad click throughs from Yahoo Search Marketing if you add paypal to your payment options. Paypal helps us keep our retail store humming.